It was not long ago that Ireland was every American conservative's beau ideal of a European state. Low taxes, low regulation, it was the operfect case study in the success of free market policies. One exception to Europe's tepid economic performance has been the Irish. Ireland -- which I visit regularly, including this summer -- is an economy on fire. As recently as the late 1970s, when I attended college in Dublin, the country was still a kind of developing nation. Today, after two decades of red-hot growth, the Irish, stunningly, enjoy a per capita income higher than the Germans. How has Ireland become a "Celtic tiger" (a la Hong Kong, Taiwan and Singapore, the earlier "tiger" economies in Asia)? Simple: By clinging for dear life to the coattails of the American economy. The Irish have basically set themselves up as a free enterprise zone for U.S. companies wanting a base in Europe, rolling out a business-friendly red carpet. The government also mimicked American growth policies in some important areas - chopping taxes and reducing regulations. More than in other parts of Europe, Irish entrepreneurs studied and then cloned some of America's hypercapitalist airlines, energy companies, communications businesses and computer firms. Ireland's smashingly successful Ryanair, for instance, is a direct knock-off of Dallas-based Southwest Airlines. The fact is Ireland had not been catching up for 30 years; it accomplished its catching up in 13 years. Rapid rates of growth have continued to be recorded since converging with Europe’s standard of living. The neoclassical growth model does not account for Ireland’s success. Rather, rapid growth has been driven by increases in economic freedom. As long as Ireland continues to pursue policies that increase economic freedom, the Irish “miracle” is likely to continue. In the 1980s, Ireland faced the same dilemma that now confronts the EU. It made the wise choice to implement supply-side tax reforms that were and are still successful. Sweeping corporate tax rate reductions from 38 percent to 12.5 percent created a decade of economic growth, and the "poor man of Europe" is now the "Celtic Tiger" with the second-highest living standards in the EU (behind tax haven Luxembourg). The Irish model shows how fiscal discipline and low tax rates help attract capital and entrepreneurs instead of scaring them to other countries. Ireland doesn't have a flat tax, but it has slashed its corporate tax rate from 50 percent to 12.5 percent. Combined with other tax cuts, this helped turn the "Sick Man of Europe" into the "Celtic Tiger." Unemployment has dropped from 17 percent to 5 percent, and Ireland is now the second-richest nation in the European Union. Instead of double-digit unemployment, Ireland imports workers today. Instead of little or no growth, Ireland's growth outstrips world averages. The 'sick man' of Europe has become the Celtic Tiger, with prospects far better than those of its neighbours on the continent. How did this happen? Ireland went against the grain and made it easier for people to pursue their dreams. It adopted pro-market, pro-growth policies that have made it the fastest-growing economy in Europe and the third-freest economy in the world. On Saint Patrick’s Day, we wear green and celebrate the culture of Ireland. I’ll be down at the pub Saturday, but I’ll be toasting Ireland’s success at attracting greenbacks — all that investment flowing into the Emerald Isle and the resulting prosperity. Ireland has boomed in recent years, and it now boasts the fourth-highest gross domestic product per capita in the world. 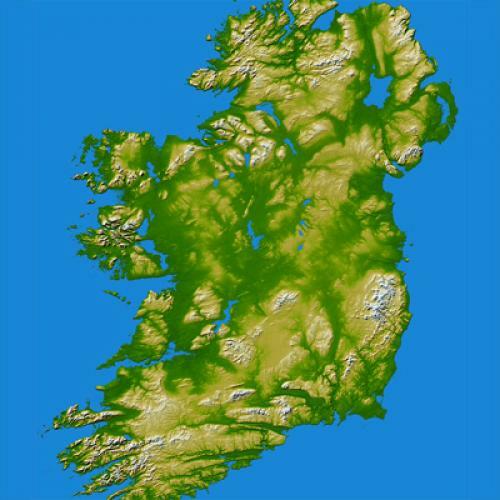 In the mid-1980s, Ireland was a backwater with an average income level 30 percent below that of the European Union. Today, Irish incomes are 40 percent above the EU average. Was this dramatic change the luck of the Irish? Not at all. It resulted from a series of hard-headed decisions that shifted Ireland from big government stagnation to free market growth...Now if only we could chase the leprechauns out of this country and cut our corporate tax rate, we’d be enjoying Irish-level growth rates by next St. Paddy’s Day. Though Greek deficits and debts have dominated the news lately, Ireland's fiscal crisis was widely considered at least as dangerous to the euro late last year. Ireland is in the worst trouble of all the eurozone countries, the International Monetary Fund then reported. Ireland's budget deficit was as large as that of Greece in 2008, and the Irish economy had shrunk 9 percent in 2009. But we don't hear much about Ireland today. Why not? Because that country successfully repeated what it had done so boldly in the late 1980s — slash spending on payrolls and benefits, subsidies and transfer payments. Ireland's public service salaries, for example, were reduced last year by 5 percent to 15 percent. Unlike Portugal, Ireland did not adopt damaging tax increases. Unlike Greece, which is getting ever deeper in debt to its neighbors by begging for a bailout, Ireland is now lending 1.3 billion euros to Greece. In short, Ireland offers an admirable lesson in fiscal responsibility for Greece, Portugal and Spain — and, possibly, the United States. Sadly, the Irish fiscal crisis has prompted a quick realization that Ireland was not actually the free market state we thought it was. Indeed, it turns out to represent Obama-ism run amok. There is a crucial aspect of the Irish crisis that everybody appears to have forgotten, which goes a long way towards explaining Ireland’s problems: its membership of the dysfunctional single currency, an institution it should never have joined. Ireland, like Britain, had its economy deformed by debt — the result of year after year of dangerously cheap credit, aided and abetted by central banks. Ireland’s cheap money came from the European Central Bank, which kept interest rates even lower than the Bank of England, thus guaranteeing an even greater boom and subsequent bust. Even in January 2006, when many of the stupider lending decisions taken by Irish banks were being planned, eurozone interest rates were only 2.25 per cent. This arguably made sense for Germany, but was absurdly low for Ireland; it could have done with 9 per cent. Let me say that I’m quite willing to believe that an excessively progressive income tax in Ireland exacerbated underlying political economy problems...The structure of the tax system was a problem, but it wasn’t the mere fact that top-line rates or even total revenues were relatively low...Yes, the state grew dependent on the housing bubble. But the strikingly low quality of the Irish state and overcompensation in the public sector (two sides of the same coin) were clearly relevant to the broader fiscal picture. And that raises a different set of questions. A big reason for Ireland’s current sub-crisis is that in the fall of 2008, the nation guaranteed all of its bank liabilities. This fateful choice was not a market decision, but a government one. One could make the case that had Ireland let its bank bondholders go, as Iceland did, Ireland would be better off today. Unlike Greece, Ireland has competitive tax rates, an English-speaking population, and a workforce that desires work. But Ireland instead hitched the brick of bank liabilities to its sovereign balloon. The balloon hasn’t brought the bricks up; the bricks have brought the balloon down. Europe — if the Continent (and Britain) were to require Ireland to raise its tax rates as a bailout condition — could pop it. That price may be too high for Ireland. But now, Ireland can’t undo what it did two years ago, at least not easily. Because of Ireland’s guarantees, investors would view dropping the banks now as a selective sovereign default. The one thing we can definitely say, though, is that lower tax rates did not cause Ireland’s problems.